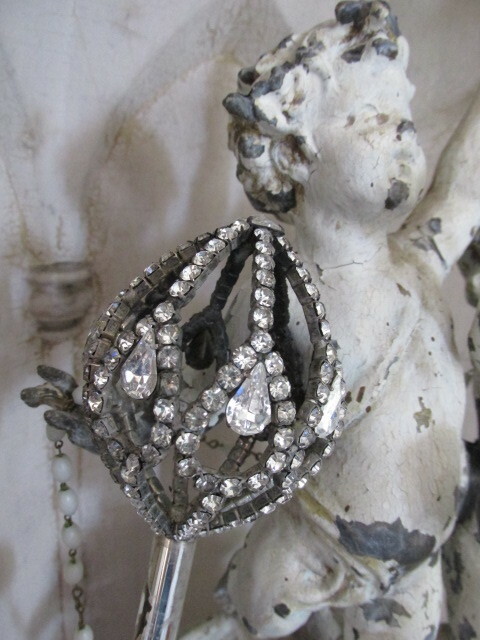 THIS IS A GORGEOUS SCEPTER WITH RHINESTONES WITH AN OVAL SHAPE THAT WOULD BE STUNNING ON AN OLD STATUE OR FOR DISPLAY. This has a nice long metal handle and the jeweled oval shape top. The design and pattern are just gorgeous and the rhinestones are prong set. PLEASE NOTE there are 2 missing stones. The silver metal has discoloration, and tarnish and a little rust at the bottom of the wand for a fabulous time worn patina. I show how is looks fabulous in the hands of a statue, sitting in an urn filled with treasures, or with a little display. You could display it with your collection of statues, or set it out with your rhinestone bottles, perfume bottles or other rhinestone items or display it to be the crowning piece to your vintage crown and tiara collection! Perfect for any shabby chic, romantic cottage, or French country décor, or for a store display. Measurements are about 19" long by about 2 1/4" by 3" for the rhinestone top.